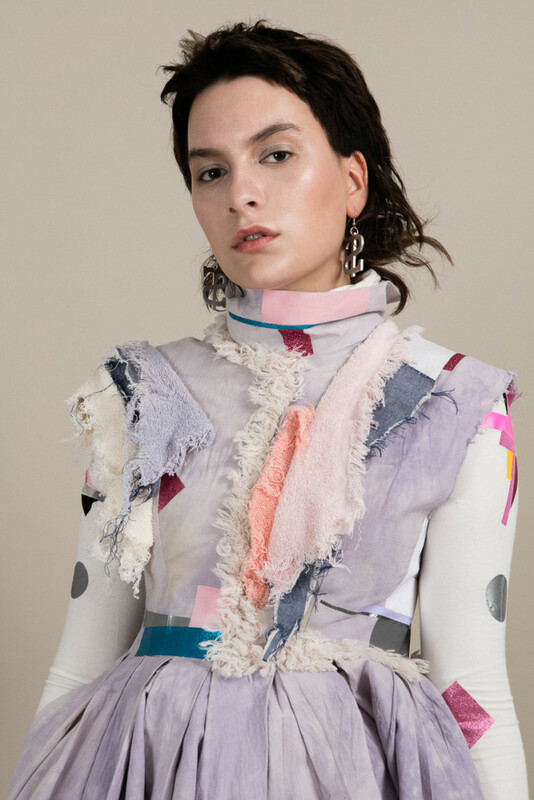 This amazing handmade fashion news comes in the form of London College of Fashion graduate Sofia Ilmonen. 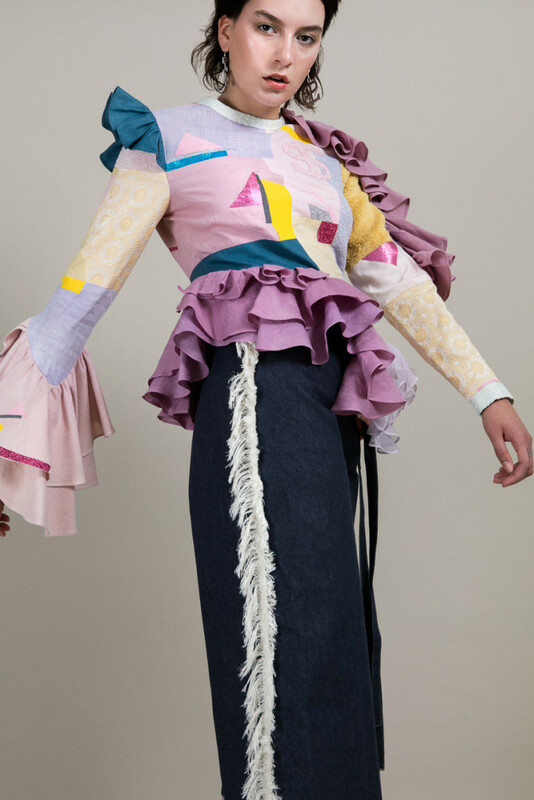 The playful modern designs of her graduate show saw her named by Wonderland Magazine as one of the graduate ‘Ones to Watch’ and also as one of ‘200 Emerging Designers’ by Vogue Italia. The best part? She is a sustainably minded and conscious designer with a true passion for the joy of hand crafting. Using a combination of reclaimed and sustainable fabrics Sophia is on the way up, and I’m so thrilled that our organic denim features in many of her pieces! I got to hear all about how she brings a garment to life, and I’m certainly left feeling inspired. 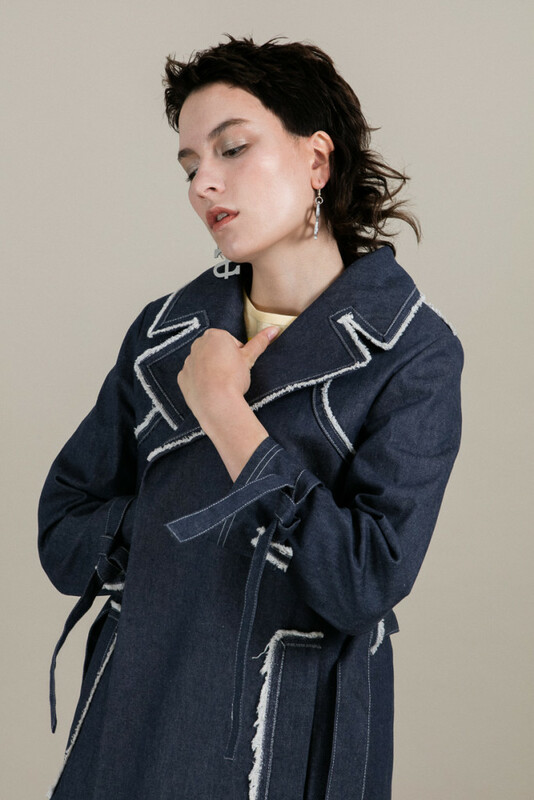 Our organic denim taking pride of place in this Sophia Ilmonen coat! Sofia: My interest in fashion started young while watching my mum sew clothes for me my siblings and I. For materials, she used whatever was available. I was just fascinated by how creatively and beautifully she handcrafted things. For this reason it was natural for me to follow the same path. I greatly value the fact that creating garments in this way means that every piece is unique, and you can really see the maker’s own touch. This one-of-a-kind feel is a big part of my brand ethos, and although there may be several of the same pieces, each of them are infused with the story of the fabrics and techniques used, and of course the maker’s (my) signature. I use quite traditional techniques. I start by draping the fabric on a dressmaker’s stand to consider my idea, before moving to the hand drawn flat patterns. After sewing the first initial toile the shape and proportions may change a lot, once I see how my chosen fabric drapes and falls. I sometimes use old clothes as an inspiration and starting point. I then try to restructure them to create new shapes and designs for pieces. Details, colour combinations and textures simply come together through playing around and having some fun; more is more tends to be my motto on this! You can see the gorgeous violet and mauve subtleties of the vegetable dye Sofia has used for this outfit, which can only be brought out by dyeing organic natural fibres. Amazingly creative use of fabric remnants! I am determined to use organic, reclaimed or recycled materials and fabrics. It might be challenging at times if you have something specific in mind but I would argue that it just requires bit more creativity and determination. I dye using vegetables, berries and root dyes. I fray, patch, hand-embroider, embellish and I am always seeking new ways to reuse something which might be considered waste. It’s amazing to see materials that might have ended up in landfill turned into something completely different and beautiful, telling a new story in their new form. With my last collection I reused most of the fabric offcuts from my designs by creating multi-layered textures and prints using iron-on fusible tape given to me by a friend who runs a small haberdashery shop. Love this combination of pinks and peaches, brings summer right back! There’s something of a Matisse collage about this! The shapes and dashes of colour! There has definitely been a change towards ethical clothing and I am very excited to see some new sustainable yet innovative fabrics and clothes being produced. More importantly people’s views are shifting. 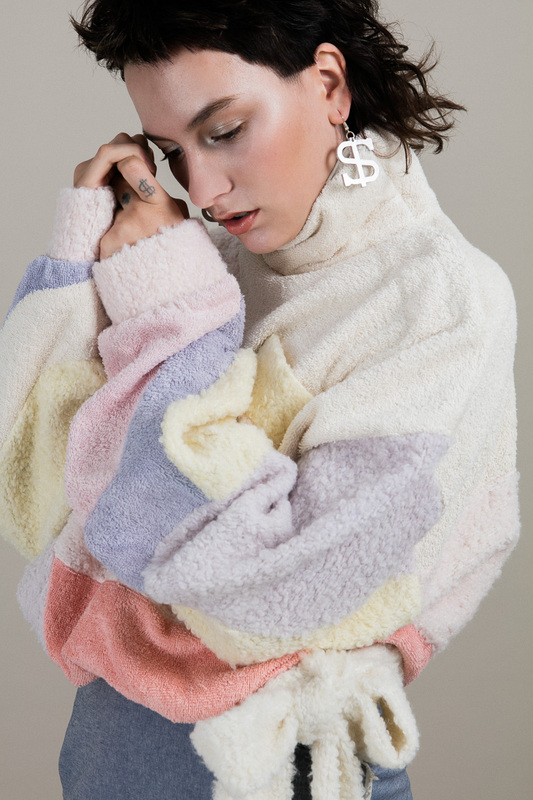 I think many people are starting to ask themselves the question ‘Can a garment ever be truly beautiful if you are aware of the unethical and unsustainable practices behind it?’ Sustainable and ethical fashion is the way to go for sure, and one step at a time I am proud to be walking on that same path! If you’re feeling inspired by Sofia’s designs, check out our selection of organic denim. Fabrications on Broadway Market also have some newly in! And… did you know that Offset Warehouse sells bags of fabric scraps? They’re so much fun because you never quite know what you’ll get — interesting weaves, soft felts, stretchy jersey, and even smooth silk replicas. I’d love to see what you can do with our bundles of scraps and offcuts!! Make sure you’re signed up to our monthly newsletter to receive more amazing blogposts from us. Please do tweet this article with the links throughout and below.